Because of it's extraordinarily gentle effectiveness, chamomile is the first herb of choice for many home remedies. The seemingly endless list of uses for chamomile can all be traced to its effects on the nervous system and digestive system, as well as its anti-inflammatory and antibacterial properties. Chamomile is a great herb to grow in the garden or buy in bulk, because there are so many different and amazing uses for it. Besides being one of my all time favorite evening herbal teas, dried chamomile flowers in a simple muslin bag make a wonderful, relaxing bath. I also love that sweet, apple aroma in herb pillows. Emotional healing : Chamomile calms anxiety, eases stress and may have a positive effect on attention deficit disorder (ADD). Chamomile tea and chamomile oil are safe for children and babies who have trouble sleeping or are under stress. Digestive Tonic : The bitter principles in chamomile make it an excellent tonic for the liver and digestive system. The bittersweet flavor stimulate the gastric juices, and help to settle the stomach. Chamomile teas can be used as part of a treatment program for irritable bowel syndrome because of its antispasmodic properties. Chamomile tea is approved for use by the Commission E for gastrointestinal spasms and inflammatory diseases of the gastrointestinal tract. Chamomile's anti-inflammatory actions soothe inflammation throughout the digestive tract. 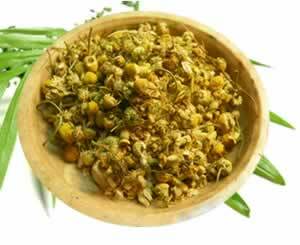 Chamomile is more effective for nausea and morning sickness when used with ginger. Steep chamomile for at least 20 minutes to more thoroughly extract the bitters. Beautiful skin and hair: Chamomile contains compounds that are antibacterial and anti-inflammatory; one of these, the lovely blue chamazulene, is noted for promoting tissue regeneration. The anti-inflammatory effect of the essential oil applied topically improves skin regeneration. Skin washes and baths with chamomile tea can calm skin inflammations, as well as bacterial skin diseases according to the Commission E Monographs. The anti-inflammatory effect of the essential oil applied topically improves skin regeneration and a cold compress does wonders for puffy eyes. Cooled chamomile tea used as a hair rinse brings on the highlights in blonde or light colored hair. Add lemon juice to enhance the effect. Chamomile flower extracts are helpful in managing eczema . First Aid : Both Chamomile teas, and chamomile essential oils can be used in herbal skin washes to help heal cuts, scrapes, and abrasions. To treat boils, bath the area with hot water and a blend of 3 to 4 drops chamomile, lavender and tea tree oil twice a day. Chamomile also teams up with lavender oil as a treatment for minor burns. Chamomile makes an effective hot poultice to reduce swelling and ease pain when applied to a swollen jaw, or painful ear. For a dental abscess, put 1 drop of chamomile oil on a cotton ball and apply directly to the abscess. German chamomile used as a gargle is beneficial for gingivitis. A gargle made with chamomile tea approved by the German Commission E for bacterial infections of the mouth and gums. Preparation Methods & Dosage :Steep chamomile tea gently for relaxation, longer for digestive upsets. Chamomile tea is yellow, slightly bitter, with a light apple aroma. 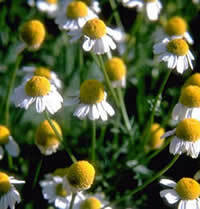 Chamomile works on all levels of the body/mind, healing both physical distress and calming emotions. Dried chamomile flowers are used to make herbal baths, sleep pillows and poultices. Steeped chamomile flowers in a muslin bag makes an effective hot poultice to reduce swelling, and ease pain for toothaches and earaches. Relax in a bath of chamomile flowers and sooth your mind while you renew your skin. Azulene, a major active chemical in chamomile, an excellent anti-inflammatory agent and a beautiful intensely blue color. Chamomile Side Effects: Chamomile is one of the safest herbs but can cause problems to those who are allergic to the ragweed family. Check for sensitivity before using. Chamomile contains the natural blood thinners known as coumarins, avoid chamomile teas when taking prescription blood thinners. Flowering Season:The flower heads are picked during full bloom in summer for use in herbal medicine. Leaves and stems have much lower content of therapeutic essential oils than flowers. Distribution:Native to Europe. Chamomile is one of the oldest know English medicinal herbs and belongs to the daisy family, which it strongly resembles. The fragrance of chamomile flowers is often likened to apples. The two species Roman chamomile, Anthemis nobilis, and German chamomile, Matricaria chamomilla are almost indistinguishable from each other to the non-botanist. Roman chamomile forms a mossy, low-growing mat perfect for walkways and ground covers. Matricaria, may occasionally live longer as a biennial or tender perennial. Easy to grow from seed, pretty, daisy like flowers bloom from early summer to autumn. While chamomile can be grown in the garden, those of us without large plots will not be able to harvest flowers to meet our needs. Ormenis mixta syn. O. multicaulis Moroccan Chamomile is not a true chamomile, but a botanical relative. Colonists brought the tiny precious seeds to America with them, and chamomile continued as one of the most frequently used home remedies to quiet babies, and as a tea for nightcaps. 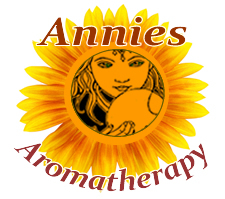 Chamomile soothes the spirit and can be a magnet for gentle nature spirits. It attracts prosperity and love, and the tiny flowers are enjoyed by flower fairies. Maud Grieve. "A Modern Herbal" Harcourt, (1931) The Greeks named it 'ground-apple' - kamai (on the ground) and melon (an apple), the origin of the name Chamomile. The Spanish name Manzanilla, means little apple. Claudia Muller-Ebeling, Wolf-Deieter Storl. "Witchcraft Medicine" Inner Traditions, (1998) Norsemen saw the countenance of the sun god in this yellow Asteraceae with it's white radiant crown, and called it "Balder's Brow". Chamomile is one of the important herbs of midsummer and is often included in the nine herbs of the summer solstice.